I played a hideous amount of Rainbow Six Siege during the holidays. Now back at work, I'm sitting at my desk looking over the Sydney business district, wondering what surfaces on the opposite building can be breach charged. Or else I'm wondering how I could get a drone inside. There's a dearth of conveniently sized trapdoors in the real world. I've noticed that, recently. 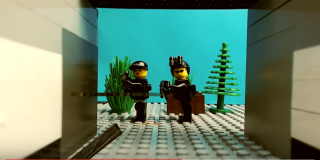 Then this video popped up: YouTubers Blacksheep Pictures have gone and made a whole round of Rainbow Six Siege with Lego. Better still, I can write about it, thus spending at least twenty minutes thinking about Rainbow Six Siege without feeling guilty. Following the game's most recent patch last week, the first proper DLC will hit in early February, with a new map and new operators promised.